This is one of the smaller members of the warbler family, and tends to stay at the tops of the trees, which makes it easy to hear, but hard to spot, despite its golden chest and throat. Their nests are hidden in lichens or moss, which makes them very difficult to find, except by the parents of course, who tend to use them year after year when returning from migrations. This amphibian gets its name from the sound it makes at the start of spring, when they are readily found on the forest floor. The ‘X’ mark on its back is its distinguishing visual feature, and its stature is similar to the Chickweed Geometer – It’s around the size as a dime. Somewhat surprisingly, they hibernate during the winter, and can survive being partially frozen. This perennial with tiny, bright-yellow flowers is abundant in the eastern US, and is easily spotted along the edges of swamps and meadows. It has many medicinal purposes, and is edible, in addition to being suitable material for a fine, aromatic tea. It’s also a bellwether for the start of school coming soon, as it blooms in August. This fish is a favorite of sport fisherman across the country, including myself. Mature adults are crafty and hard to catch, but fight like mad when hooked; there are few sights more spectacular than seeing one leap several feet out of the water when being reeled in. Their nests are easy to spot in shallow water, where they appear as groups of dark circles around two feet in diameter – The male creates the nest by keeping its head in one place and spinning itself in circles with its tail, ‘blowing’ the sandy bottom up and away. This one is pictured with its mouth open (of course) and its accordion-like jaw extended as it attempts to catch its prey. The Mud Hen has a high-pitched, rising cry that’s easy to recognize in and around the wet, swampy areas it frequents. Its feathers are black and gray, and its beak is white with dark, redish-brown marks near both head and tip. Its eyes are a striking, bright red, and its feet are very large and grayish-green, with strange web-like scales. The Mud Hens of the Great Black Swamp have a particularly strange predilection toward wandering in baseball parks, greeting children and fans. This flower is common throughout the region, and is a dusty purplish-pink in color. Its head is uniquely cone-shaped, which is where it gets its name, and (contrary to the commonly-held belief) it is not an alien from France. Despite its popularity as a nutritional supplement, scientific studies have thus far been unable to find meaningful evidence of desirable health effects. It is, however, robust to environmental variations, and certain species are useful for prairie restoration. This spider hunts during the day, rather than ensnaring its prey in a web. It uses its widely-dispersed eyes to accurately gauge the distance to its intended victim, upon which it leaps from great distances (hence its name.) It is largely covered in hairs, which look like fur under magnified observation, and which presumably function as sensing organs. Its fangs are an iridescent green in color, and though its bite is toxic to bugs, it is largely harmless to humans, which it rarely bites. Tall, beautiful stalks of Cattails can be found in large numbers waving gently in the wind around the wetlands of the Great Black Swamp. The distinctive, hotdog-shaped growth around the stem is actually hundreds of tiny flowers compressed together; when they ripen, the ‘dog’ disintegrates into a cotton-like fluff of hairy seeds that can float great distances to spread their genetic heritage. They are very successful competitors for territory, and will readily crowd out other plant species if left unmanaged. These common mammals dig vast burrows underground in the transition areas between woods and plains. They are the bane of many a gardener’s existence, due to their voracious appetite for vegetative matter. They are active in daytime, and are easy to spot from the road, as they frequently stand on their hind legs to get a better view of their surroundings. They are largely solitary, but they will warn one another with high-pitched whistles when danger approaches. 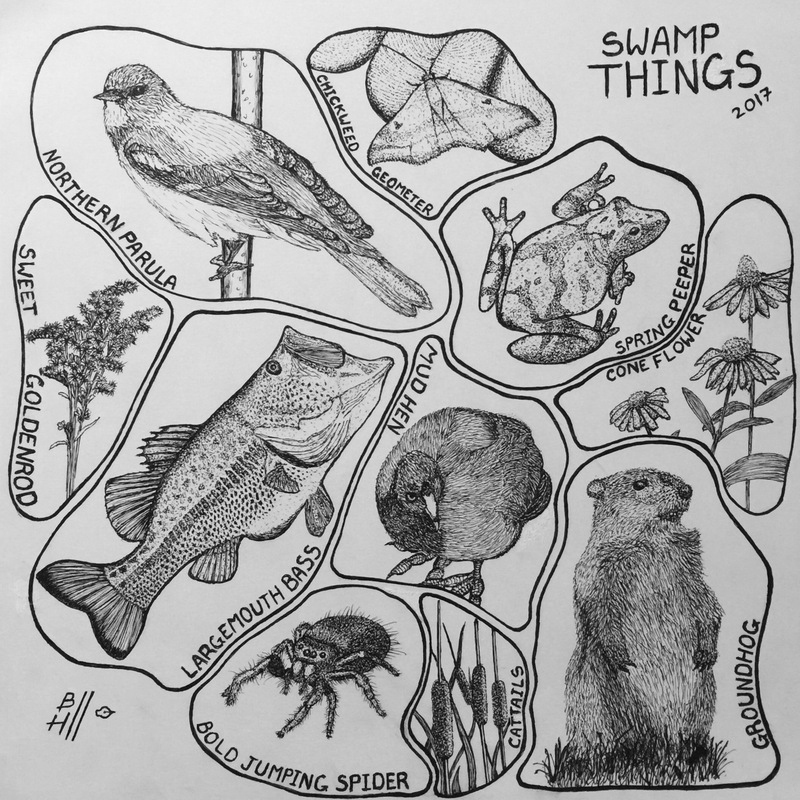 This entry was posted in Art, Pen and Ink and tagged animal, fauna, flora, flower, plant, swamp, swamp things by bill. Bookmark the permalink.